After the golden age of violin making in Amsterdam in the second half of the 17th century and the subsequent period of decline after 1725, the centre of gravity of Dutch violin making moved to The Hague. Johannes Theodorus Cuijpers (1724–1808), who was born in Dornick (now part of the city of Emmerich) is the most prominent maker of this school. His early style is very much influenced by French violin making, but no evidence exists that he ever learned in Paris as is often suggested. In my opinion, though there is again no proof, he might very well have been trained by the little-known French maker Jean Baptiste Wattier, who was active in The Hague until his death in 1755. Early Cuijpers work, although more refined, certainly resembles Wattier’s style. The earliest Cuijpers instruments, signed with a printed label (after c. 1770 he starts using handwritten labels), appear around 1750 and are of a very elegant style reminiscent of the Parisian makers Louis (or Ludovicus, as he signed his labels) Guersan and Jean Baptiste Deshayes Salomon, including their slight Stainer influence. In the later period of his long and productive life his style becomes heavier and more personal, though we can also see the influence of Nicolò Gagliano. 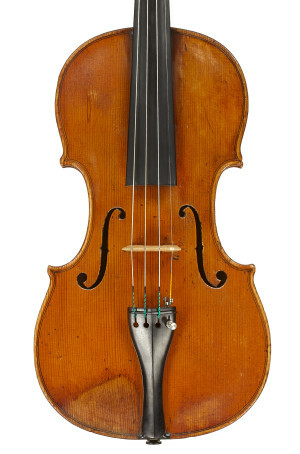 This fine violin, labeled 1767, is one of the later instruments that bears a printed label. Cuijpers was still working alone at this point and his output was probably not too large, as we do not see many instruments from this period. It shows the elegance of his early works but the hint of Stainer is gone. The f-hole is longer than in his very early work, the arching flatter and the instrument has become more personal. The head, which has the long pegbox he made throughout his life, now has the typical, vertically aligned, oval volute. The varnish is of a good consistency and the color is golden–brownish. Noticeable is the somewhat ‘burnt’ structure on the places worn by chin and hand, where it looks as if the varnish became too hot and consequently small bubbles formed, which over the years have filled with dirt. 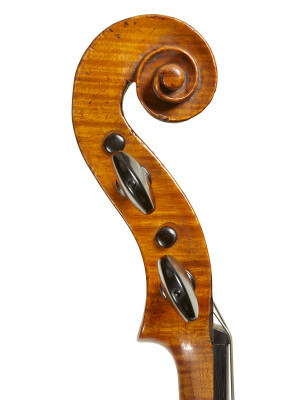 In many aspects this violin anticipates the great number of instruments that would be produced in the Cuijpers workshop during the years 1785–1808 with the help of his sons, Johannes Franciscus and Johannes Bernardus (perhaps significantly, Wattier’s sons had identical names), but it does not yet show the boldness of that period. Cuijpers always used the same type of maple, which in my opinion was locally grown, generally with a not very deep, yet attractive flame. He apparently had a large stock of spruce as well: many of his instruments have one-piece tops of strong, regular growth. Son of the respected violin maker Otto Stam, Serge Stam is a leading expert specialising in the Dutch and Flemish schools of making.